LUM is above all a spiritual encounter, a ritual séance for the acquisition of one’s essence, a ceremony. In a way, it's also a therapy alleviating personal sorrows and, well, by extension, mitigating the civilizational predicaments. To a certain degree, it's a course in tribal culturology. Fundamentally, it is LUM's dream. LUM actually lived those spiritualities. More specifically, Sebastian Gandine has been for years observing how music is integrated into native cultures, identifying its social functions, acquainting himself with its principles, learning instruments, recording sounds, participating in various rites -- in the range from passage to burial -- and reinterpreting his multiple findings in the paradigm of digital technologies. There is much more to it what makes LUM an act so extraordinary and so stupendous. We learn his music originates in his near-death experience dating back to his late adolescence. LUM surprises us by asserting that this experience has been his most astounding, enlightening and liberating trip ever taken, its traumatology notwithstanding. He recalls himself abandoning his body and dissolving into a pure free-flowing consciousness, released from mundane practical concerns, unplugged from the time-space-causality matrix. With the chronometry no longer intrinsically applicable, the ineffable durée could have lasted a nanosecond or millions of years. He remembers the displeasure of recombination and awkwardness of reconnection with his body, his short-circuiting with its basic needs, conditioned reflexes, crude cravings and "robotic" functions. He astonishes us even further by confessing that his strive as a musician is motivated in great measure toward reaching the heights of pleasure he once accidentally reached by falling down and injuring himself. His playlists, too, are compiled of pieces that remind him of his beautiful death-like adventure beyond his subjectivity. Which takes us to the question of Ego -- what role it plays in his creativity. Far from an episodic role and it's negative. This explains why every morning starts for the musician with a meditation, in the course of which Sebastian prepares himself for immersion with the world withdrawing himself in contemplation from his false identity which inevitably builds up in social contexts -- in order to preserve his essence; obliterating at the outset a would-be narcissistic search for being loved, validated, appreciated. To expound on it: as a norm, one's presence on stage in the spotlight evokes all sorts of energies in the crowd -- sexual energies, sympathy, adoration, commitment, but also envy, jealousy, resentment, disapproval... It's vital to abstract oneself from them all, felt favorable or otherwise, so there is nothing in between the musician and his music. Years down the road from the point of his starting as a producer and performer, LUM would have been by now a household name across the continents -- but for his resolve to remain true to his essence. Sebastian's soul searching for authenticity prompts personal and professional decisions far more radical than cancelation of his Ego under the scrutiny of the Ego-driven audiences and complete self-abstraction away into his music. On the path of maintaining his true being and discovering more of it, Gandine goes so far as to abrogate much of his audience, the size of which is responsible in the equal measure for one's popularity. This he achieves through near absolute refusal to play in clubs entertaining the impersonal masses and in their terms, not especially lofty ones. His generative milieu are small gatherings -- usually in the open -- the audience consisting of friends and their tight circles. A more drastic move in this direction would be to play his music to himself. Which Sebastian most of the time does, anyway, composing it in his studio. 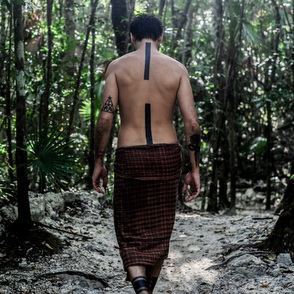 Tulum where LUM currently resides in the self-imposed exile on the run from his native Argentina, to the social scene of which he could not fully connect, not a bit, is fundamentally two things: the jungle and the beach -- the rest is history. It's from the former that LUM extracts much of his élan vital. The beach is just a lot of hot sand, sterile substance; while history -- any history -- is an artificiality, a linguistic construct with little relevance to one's Existenz (the state of a person being himself or herself or both). Where LUM finds real nourishment and empowerment for his genius is in plants. He is very deep into the jungle, conducting his botanical research the same way he has been researching into indigenous music. And very much at the same locations. Plants are always present as decoration for his stance on stage and the stage itself, as elements that comprise the shrine that is usually found next to the mixer -- whether as such, liquefied, dried, as smoke, as smell or already consumed and cognized through their wholesome effects on one's mind and body. An international shapeshifting duo, KMLN (pronounced “Kameleon”) unites Italian producer / multi-instrumentalist Christopher Tooker and Canadian producer​ /fashion designer Shawna Hofmann. May it be a prime time or sunrise set, they adapt and deliver sets that blow your mind and bring your dance skills to the next level. Live instruments, syncopation, organic meets modern, future meets past. As interplanetary travelers and cultural explorers, the KMLN ship bends time through sound, blending elements of deep house/techno and global/future bass, moving through tempos with layers and layers of mind altering colors. With the support of artists such as Nico Stojan, Acid Pauli, Bedouin, Damian Lazarus, ​Mira, DOP, Nicola Cruz and more, KMLN keeps surprising and raising the bar hitting # 8 top 100 releases, # 4 deep house, # 4 electronica /downtempo on Beatport. With write ups and features on publications such as XLR8R, Dancing Astronaut, Ear Milk, Resident Advisor, Ibiza Voice and making it into Beatport’s "must hear deep house”, their music is found on labels such as Crosstown Rebels, Sol Selectas, Touch of Class and Endless. Self-described as a "sonic explorer," CHRIS NITTI has DJed in DC for five years; sharing the bill with Green Velvet, Stacey Pullen, Maya Jane Coles, Blond:ish and Nick Curly.